Blog – Page 2 – Christina M. Colvin, Ph.D.
My Animal Studies Research Guide is currently featured on the Emory Libraries’ Research Guide landing page. If you’re interested in animal studies, currently conducting research, or even if you’d like more information on the field, this guide may be for you. I’d be excited to receive your comments! I’ve also created a research guide to support students and scholars interested in ecocriticism. Go here for my Literature and Environment Research Guide! My blog, “Animals in the Archive,” was recently published on Emory University’s Woodruff Library Scholar Blog. In this post, I discuss what it may mean to encounter animal remains, including some unidentified teeth, tusks, and claws, inside an academic archive. Yesterday the Kimmela Center for Animal Advocacy, directed by Dr. Lori Marino, published my blog entry, “The Caring Chicken – Being a Mother Hen.” In this post I review several recent scientific studies of mother hens to show that these chickens–renowned for their dedicated care of their feathered children–really do care about their chicks. I’m so grateful for the support of the Kimmela Center and to have such a great opportunity to share these findings on mother hens. Check it out! Growing up in Florida where the ocean was only a brief car ride away, I was conscious of my privileged proximity to sea creatures. Though not an everyday occurrence, I remember several occasions during my childhood when a pod of twenty-something dolphins swimming just off the shore punctuated a day of swimming and snorkeling. As a Florida kid, too, theme parks of the Disney, Universal, and Busch variety were also (an albeit less-frequent) source of entertainment, and a two-day pass to SeaWorld meant getting to see, feed, and even touch all the marine creatures I wanted, even the big mammals–those shining, speeding dolphins–who I at other times watched at a distance. I loved the dolphins in the tank and in the sea equally, and I hoped that they loved me, too: as children often do, I wanted to be friends with animals, for us to recognize in each other a sense of goodwill. In our post-natural world, one in which it no longer makes sense to appeal to a pristine Nature separate from Culture, or even to call wild animals “natural” and captive animals something else, how can we make sense of the differences between my relationship to the cetacean companions in the tank and those in the sea, both of which gave me so much pleasure to encounter? Gabriela Cowperthwaite’s recent documentary Blackfish provides one explanation. The film describes the capture, exhibition, and use of the orca Tilikum who, even after being involved in the deaths of three human trainers, continues to be held by SeaWorld for breeding purposes (as well as limited aspects of performance). In addition to Tilikum’s history, told alongside tales of other captive orcas and interviews with orca trainers and experts, the film presents footage from SeaWorld “Shamu” shows, images I often felt were extracted directly from my personal memory. Trainers rub and embrace the whales, leap into the water alongside them, and jump from the tips of their noses into mid-air dives. These feats are certainly impressive, but in the context of Blackfish, what looks like a triumph of animal intelligence and trainability takes on an air of foreboding: we know one of these whales has killed people, and beyond the consequence for our species, we know that the whales themselves, because of the conditions they endure at SeaWorld and similar venues, become bored, lonely, aggressive, and often express these feelings by hurting one another. So what about the trainers and (what often seems to be) their loving relationships with the animals, not to mention the hundreds of people, like my younger self, cheering from the stands? Do the animals’ artificial living conditions necessitate that their seemingly close relationships with humans are also artificial? Drawing from Louis Althusser, Donna Haraway helps provide a partial answer. In her Companion Species Manifesto, she writes that, “[T]hrough our ideologically-loaded narratives of their lives, animals ‘hail’ us to account for the regimes in which they and we must live…We also live with each other in the flesh in ways not exhausted by our ideologies.” I read Tilikum’s story as an example of such an animal hailing, of one particular whale’s account of what it means to live in relation to humans. His is a call for recognition made through a meeting of flesh, an exposure of SeaWorld’s artifice told in orca language. Put differently, Tilikum’s behavior illustrates one example of what it means to encounter killer whales as companion species, not as characters in SeaWorld’s fictional narrative of interspecies harmony and enchantment. Blackfish demonstrates that whales have a deep and complex emotional range: they feel despair, anxiety, happiness, and much more. That said, like other animals, including even our dogs and cats, killer whales may become angry and respond with a bite. Unlike dogs and cats, however, killer whales can also drown people. This does not mean that orcas are an evil species (Tilikum may have even had a sense that what he did to Dawn was in some way “wrong” or a transgression of safe and friendly conduct). It does mean, however, that, as killer whales, they might respond to their conditions of life in species-specific ways, and when they do bite, the consequences for humans are far more severe. 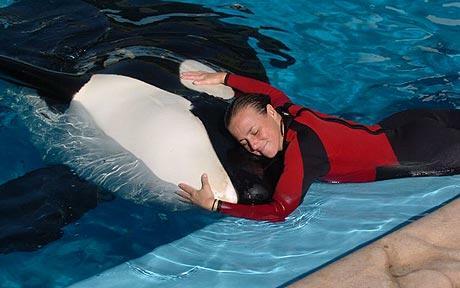 I do not doubt that Dawn Brancheau, the trainer who Tilikum most recently killed, loved the whales with whom she worked, and I do not even doubt that Tilikum likely cared for Dawn. What I do doubt is SeaWorld’s genuine interest in cultivating human-orca relationships in ways that do not obfuscate the risks intrinsic to being a companion species. As Haraway reminds us, “[t]here cannot be just one companion species; there have to be at least two to make one.” SeaWorld’s most egregious fiction may be that companion species are one-sided, that humans call all the shots in their relations with whales. For whale trainers and former visitors to SeaWorld such as myself, caring for and finding pleasure in another species necessitates perpetually taking stock of the terms of the relationship. Being a companion species can be messy, and communicating across species even messier: mistakes and missteps are bound to happen. More than some isolated incident, however, SeaWorld’s glossing-over of these issues in attempt to manufacture flawless, entertaining performances ignores the specificity of whales as animals, as creatures smart, social, carnivorous, and strong. By acting out as a killer whale, by communicating not according to some human sense of what constitutes “good behavior” but as a nonhuman animal, Tilikum calls to be recognized and treated as a killer whale and therefore with all the messiness and risks that entails. How we respond to Tilikum’s call reflects what kind of companion species we humans aspire to be, regardless of whether we encounter our fellow animal in a tank or across an ocean. The load screen for Naughty Dog’s latest PlayStation 3 release The Last of Us confronts players with an inexplicable image: against a blank, black background, tiny yellow particles emerge from an unseen source to waft on currents of air. Having read little about the game beforehand, I guessed at what these particles represented: dust motes, I first thought, recalling the unkempt, long-abandoned window of a home featured on the title screen. That plants overgrow the window also suggested the specks were pollen: Atlanta-residents and allergy sufferers such as myself are well-familiar with the thick, suffocating waves of the stuff emitted by local trees every spring. My second guess inched me closer to an explanation, but it wasn’t until I encountered the infected–the game’s zombie-esque creatures–that I recognized the particles for what they were: spores. In The Last of Us, humans are no more removed from the threat of this fungal infection than ants. Such a demotion in our species’ status from beyond the natural world to thoroughly immersed in it disorients as much as it frightens. The Cordyceps fungi already unsettles us when we see how it infects creatures as evolutionarily dissimilar from us as ants (not to mention something as far removed from our normal range of sympathy as insects): when we think about this fungus evolving to invade our bodies, the horror quadruples. The Last of Us, then, asks that we imagine ourselves as like ants: vulnerable, embodied, and animal. As in other thoughtful post-apocalyptic texts (Cormac McCarthy’s 2006 novel The Road, to which Naughty Dog’s game is frequently compared, strikes me as an apt example), The Last of Us tells us as much about the present world as it does about a fictive future. Does the “us” of the title refer to a set of pure, uninfected humans, either in the present time or in the game? And in our current reality of carbon emissions, particulates, and yes, viruses, pollen, and spores, who could count as uninfected? Timothy Morton provides some helpful insight when he writes that, “The insides of organisms teem with aliens” (The Ecological Thought 36). He further explains that, “When you sneeze, is it because a virus manipulated you to propagate its DNA? After all, rabid animals (even gentle ones) are possessed by an urge to bite. Some parasites and symbionts are so intimate you can’t tell where one starts and its habitat stops, all the way down to the DNA level” (35). The permeable boundaries of living things mean that humans are not so “human” after all: we comprise and are comprised of a vast number of nonhuman, living and nonliving, things. As the game’s spores float across the black loading screen–an anonymous, anywhere space–The Last of Us invites players to fill in this blank with familiar locations, to imagine spores floating through known towns, streets, and neighborhoods before arriving in living rooms and lungs. Some particles drift off screen while others glide too near to us to stay in focus. Watching the spores, I can’t help but wonder what lingers in the air of my home, what might be invading, even infecting, my body with every breath. The game imposes an uncomfortable awareness of one’s own breathing body, sustained by an atmosphere at once nourishing and injurious. The spores remind me that my body is not, as Morton might say, “complete in itself” (33). Like animals struggling to survive as their habitats disappear beneath their feet, the environment players occupy in the game is not hospitable. A quick scan of any catalog of zoonotic diseases or a peek at this recent article on the human behavior-modifying parasite spread through cat poop (no, really!) drives home the point that we are one kind of animal among many. To my mind, the corporeal vulnerability and permeability shared across species need not evoke horror alone. 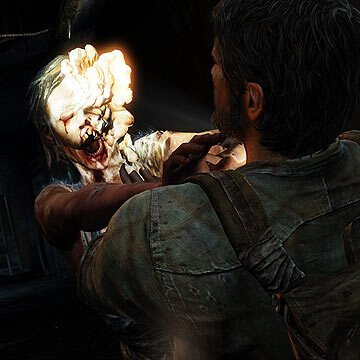 As The Last of Us teaches, the importance of surviving creatively in a hostile world cannot be overstated, and what’s more, creative survival often means supporting the survival of others. Ultimately, the game is not about the triumph of the human-as-individual: much of its intrigue derives from Joel and Ellie’s awkward but mutually beneficial partnership. They help each other stay alive, and the game thus facilitates an awareness of how one’s animal form connects to the immediate environment, to the atmosphere, and to other vulnerable bodies. Instead of responding to our immersion in the world with fear, we might use it as an invitation to extend concern to other vulnerable beings like “us,” however varied, multiple, and animal the forms of “us” might take. Mutually at risk in the world, humans and ants often share common ground, figuratively and literally.